Here are a few interesting tidbits about the 45 WR motor which I have been working on, that seemed worth sharing. Recently I put the cylinders on the flow bench; not because I intended to port them, but just to have a record of their flow. The results were surprising, at least to me. The cylinders were brought to me with the customer's understanding that they were 1948 WR. At first I assumed that to be correct, but upon a lot of online research, I managed to convince myself that they were actually 1940 WLDR Specials. But finally, thanks to Eric, one of regulars on the FlatheadPower Bulletin Board, and his Beauty of Speed web site, I have returned to my original (less informed, but correct) assumption. The cylinders are '48 WR. Clearly a case of confusion brought on by information overload. In any case, here is a side by side flow bench comparison of a WR cylinder and a stock WL cylinder. I tried to keep the tests as much "apples to apples" as possible, but here comes the disclaimer. After 62 years and very likely a hard life, an exact comparison between how the parts compared when new is well nigh impossible. But that doesn't mean the results should be discounted, just that they should not be taken as absolutes. I don't know about you, but that sure wasn't what I was expecting. The WR has a larger valve and a much larger port opening. I tested both with a clay radius inlet guide directly on the plumber fitting so that manifolds would not be a factor. I tested the WR with a K model intake valve which is 1.810" diameter, verses the WL's 1.625. Now I have seen conflicting specs as to the WR intake valve size. One source lists 1.750, another 1.810, and the worn out valves that were in the cylinders when they came to me were 1.710. Perhaps the chamber wall shrouding of the 1.810 valve is affecting the results. The chamber wall definitely shrouds the exhaust valve more on the WR than the WL, which I believe helps explain the poor flow on that side of the equation. Also, both of the valves run out of space between valve and the roof of the chamber at the higher lifts, limiting flow. I expected much more from the WR. And if that is not depressing enough for the WR aficionado, consider that a WL with a bigger intake valve and good porting will flow 124 cfm on the intake and 133 on the exhaust at .400" lift and one might begin to wonder what in the world is going on. But of course there are many other factors involved in performance, and I will only attempt to address one more of them here today. This gives a duration (measured at .053) of 240 degrees, intake and exhaust. By way of comparison, a set of stock WL cams which I had reground by Jim to his .360 lift and +10 degrees duration, check out to only 208 degrees at the same .053 checking point. But as informative as that spec is, the real eye opener is only revealed with a plot of the cam lobes. The "hot" reground WL cams held the valves within .010 of full lift for 25 degrees, both intake and exhaust. The stock WR cams held the valves in that same range for 50 degrees! Clearly, it would take a lot of flow increase from the WL cylinder to make up for the amount of air that the WR valve is able to pass with so much more time to accomplish it. Oh, and if you haven't already figured this out, it takes a gearhead mentality bordering on the insane to spend so much time analyzing a 60 year old racing motor. What is really scary, is that I am not alone; there are others out there. I like old books. I like them nearly as much as I like old bikes. I think its something about a connection to the past. When you hold an old book in your hands one can't help but wonder about those who came before you and held that same book in their hands. I haven't purchased an old book for quite some time now, but in the past I have acquired some gems. And not only have some the books been gems, but sometimes they come with a bonus. Some years ago I bought a four volume set of the collected works of John Bunyan; well, three out of a four volume set, that is. And that's OK. The fact that one volume was missing is probably what put it in my price range. Let me tell you, if you are only familiar with John Bunyan's Pilgrim's Progress, you are certainly missing a lot. He was a prolific writer, and though Pilgrim's Progress may be the crown jewel of his work, it is but one of many wonderful writings. For those of you who are not familiar with John Bunyan, he was best known for his allegorical book Pilgrim's Progress, which until very recently was the second highest selling book of all time, with only the Holy Bible outdistancing it. The fact that it lost the number two position to one of the witchcraft glorifying Harry Potter books says much about the decay of our society. It only serves to reinforce my thought that the end must be near. But back to my subject. Try as I might I have never been able to find a printing date for this set of books, though they show every evidence of being from the 1800's. The bonus? In this set of books I found a business card, clearly, having been used as a bookmark at some time in the distant past. Like I said; a bit of a bonus, and pretty cool to boot. I wonder how many of these cards have survived since Mr. Brooks had them printed so long ago? A little history, soon to be forgotten. Only collectors of such minutia, and possibly descendants of Mr. Brooks would find it of much value. Certainly no one, even in their wildest dreams, would expect to find carriages still for sale at 412 Main in Poughkeepsie. ILLUSTRATED HANDBILL - No. 23. "FOR EVER AND EVER!" Words that may be spoken by a child, but the full import of which can be understood by neither men or angels. Could we stand upon a sea-shore, and count its sand, and the number of drops of the ocean, we should fail to number the years of eternity. Millions of ages crowding on millions of ages; and again, millions of ages crowding millions of ages, would be as a brief day compared with"for ever and ever." READER YOU ARE ON YOUR WAY TO ETERNITY. Are you prepared for it? Where - how -will you spend it? 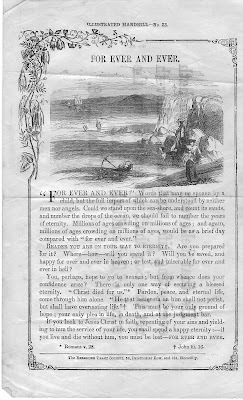 Will you be saved, and happy for ever and ever in heaven; or lost, and miserable for ever and ever in hell? You, perhaps, hope to go to heaven; but from whence does your confidence arise? There is only one way of securing a blessed eternity. "Christ died for us. "* Pardon, peace, and eternal life, come through him alone. 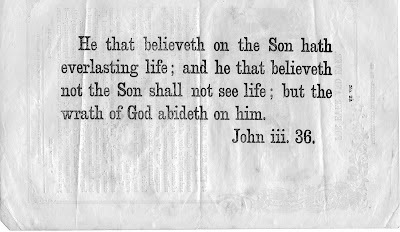 "He that believeth on him shall not perish, but shall have everlasting life. "+ This must be your only ground of hope; your only plea in life, in death, and at the judgment bar. If you look to Jesus Christ in faith, repenting of your sins and yielding to him the service of your life, you shall spend a happy eternity: - if you live and die without him, you must be lost - FOR EVER AND EVER. The Religious Tract Society, 56, Paternoster Row, and Piccadilly. As I said, good yesterday, good today, good forever. This bike is just extreemely cool. Yeah....that's extreemely with an extra "e." That's just how cool it is. Ron is one of those guys that I have yet to meet in person, but courtesy of the magic of the Internet, we have corresponded, leading to a phone call or two. It's pretty obvious what the connection is. 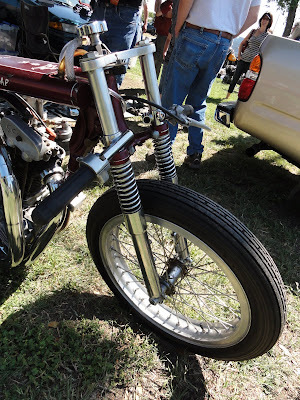 Ron and I share a passion for vintage drag bikes. In fact, when I first met Ron it was in response to a post I made about some old drag racing parts that I eventually turned into "The Knuckledragger." It seems that Ron had purchased a vintage drag bike of his own, and hoped that he could scare up some information on its history. And that wasn't even this bike! That's right, it seems that Ron is becoming something of a vintage dragbike hoarder. Seriously Ron, I am starting to wonder why these cool old pieces keep finding their way to you, or is it just because you live right. Anyway, if you are new to this blog, or don't remember Ron's other bike, here is a picture and a link. But, back to the drag bike at hand; The JAP. At first glance, the uninitiated may find a number of things puzzling. First, what exactly is it? Next, why is it named "THE JAP"? Well, that is fairly easy to clear up. THE JAP is, as with many competition machines, a marriage of many years and makes of parts. 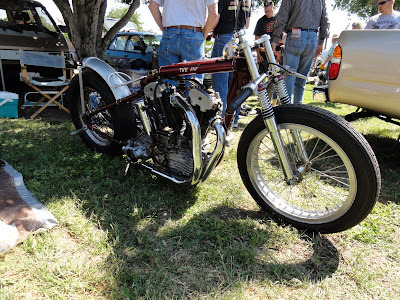 The crankcases are 1944 Harley Big Twin Flathead (UL). The top end is where things start getting interesting though. There was a company building motorcycle engines in Great Britain since the turn of the last century (that would be 1900 to you youngsters) by the name of J. A. Prestwich Industries. 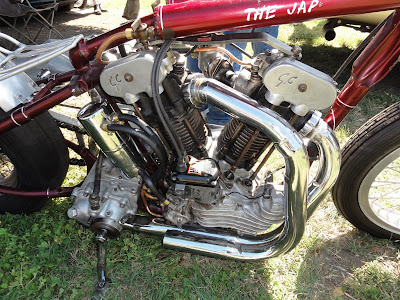 Named for its owner/founder, his motorcycle engines soon took on the abbreviation J.A.P. So the simple answer would be that this bike sports a J.A.P. top end, and hence the name. But hold your horses! That is not actually a J.A.P. top end. As can be seen in the pictures, the letters "G.C." on the rocker box don't quite match the normal "J.A.P." 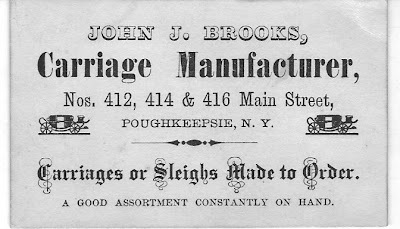 lettering on a genuine J.A. Prestwich engine, as seen below. The G.C. actually stand for Gus Carlheim. It seems that Mr. Carlheim was well known in the world of midget race cars. Working with J.A.P. engines for those racers, he eventually produced his own heads as a performance upgrade for those engines. Kind of like S&S building heads for Twin Cams as a performance upgrade....but now take it one more step and put those S&S heads on a Victory. Yeah, sorta like that. While Ron doesn't have much info on the history of the bike, he has been inside the motor, and so has some of the details. The 2 inch valves, intake and exhaust. are actuated by UL cams that have been heavily modified for increased lift and duration. Displacement is 86 cubic inches via 3 7/16" bore and 4 5/8" stroke. Ron says the flywheels that were in the motor still showed traces of originally being formed with a cutting torch, though he chose to replace them with a set from Truett and Osborn. Compression ratio is a healthy 12.5:1. 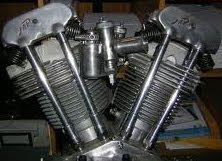 Power is relayed to the M&H slick via a standard Harley Davidson clutch and four speed transmission. Not shown in the pictures is the pair of 42mm Dellorto SS1 carbs which feed the hungry monster. One of the most "endearing" aspects of this hybrid is the "hardware store" elbow which is brazed into the seat post to link the original VL frame to the raised top frame rail. One has to wonder if the builder did some moonlighting as a plumber (or perhaps he was a plumber who did some moonlighting as a drag racer). Known history of the bike is very skimpy and all hearsay. The riders name may have been Eddie McDonald or Eddie McDowell. 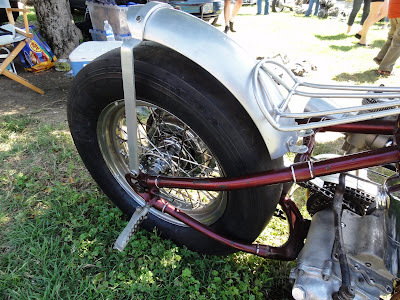 The bike may have been purchased from a SoCal shop called Cheetah Engineering (of early chopper seat fame?) possibly in 1969. The story goes that it had been dismantled in 1970, and found a home under a bench until 2009. Shortly thereafter Ron purchased THE JAP and undertook the process of reassembling it. While I am happy to see another piece of drag racing history in good hands, both Ron and I would love to hear from anyone who might be able to fill us in on some of the history of THE JAP. A special thanks to Pete at The VonPetrol Pages for sending me these pictures of the JAP and allowing me to post them here. Here we are in 2011. As they say, time flies when your having fun! A little over a year ago I took some time and wrote about my blogging goals for last year. I guess its only fair to take a look and see how I did. The first item on my list was to write about my adventures drag racing a Knucklehead during the 1986 season. Well, I took a wild swing at the first pitch and then got caught looking as the next two strikes (the rest of 2010) whizzed by. In other words, I did make an attempt at beginning the tale, but wasn't happy with the little I wrote, and never got back to it. I did just a little better with plans to do a series on installing a big intake valve in Knuckleheads. I wrote an article on installing a new exhaust seat in the heads, in preparation to to the big intake valve conversion, but that was as far as the writing went. The work on the heads continued, because I wanted them for my display at the annual Donnie Smith Bike Show in March, but I did not find the time to do an article. The heads remain in a showcase at the shop, about 90% done but still lacking a flow test. 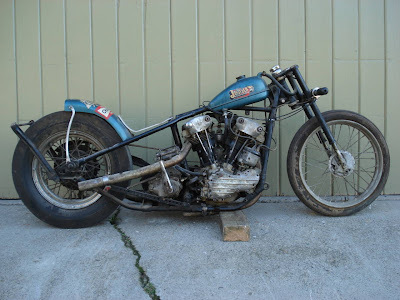 The third item on my "to-do" list, was to pursue a better flowing port configuration for Shovelheads. Here, again, I got some of the prototype work done, but nothing as far as documentation for the blog. I am excited about the project though. I have started with a set of new S&S Shovelhead castings, which have lots of "meat" to work with, along with a slightly smaller exhaust valve, which should help to give valve to valve clearance at top dead center without sinking them so deep. Of course, as usual, there does not seem to be a suitable intake valve readily available. A thin-stem (5/16") with 2.0" head diameter would seem to be in order. At least there are 5/6" stem Shovel guides available, so I won't have to leap that hurdle. So, of the three blog projects that I proposed, I finished exactly zero. What is that old saying; men make plans and God laughs? Well, I choose to laugh along with him. Performance work on vintage Harleys, while I get a lot of enjoyment from it (and it helps pay the bills), is of very little lasting value. Much more important is that which pertains to the Kingdom of God. By God's grace I was able to deliver nine sermons at the local nursing home this past year. I also spoke briefly at my brother's funeral, and I filled the pulpit twice at our Church. Many of those messaged did make it to the pages of this blog. So, going forward into 2011, what can you expect to find here at Knucklehead Theology? Well, maybe I can get some of last years projects finished up. But much more importantly, God willing, you will continue to find God's word and God's glory proclaimed here.